Astronomers survey the scale of the Universe by first measuring the distances to close-by objects and then using them as standard candles  to pin down distances further and further out into the cosmos. But this chain is only as accurate as its weakest link. Up to now finding an accurate distance to the Large Magellanic Cloud (LMC), one of the nearest galaxies to the Milky Way, has proved elusive. As stars in this galaxy are used to fix the distance scale for more remote galaxies, it is crucially important. But careful observations of a rare class of double star have now allowed a team of astronomers to deduce a much more precise value for the LMC distance: 163 000 light-years. The improvement in the measurement of the distance to the Large Magellanic Cloud also gives better distances for many Cepheid variable stars . These bright pulsating stars are used as standard candles to measure distances out to more remote galaxies and to determine the expansion rate of the Universe — the Hubble Constant. This in turn is the basis for surveying the Universe out to the most distant galaxies that can be seen with current telescopes. 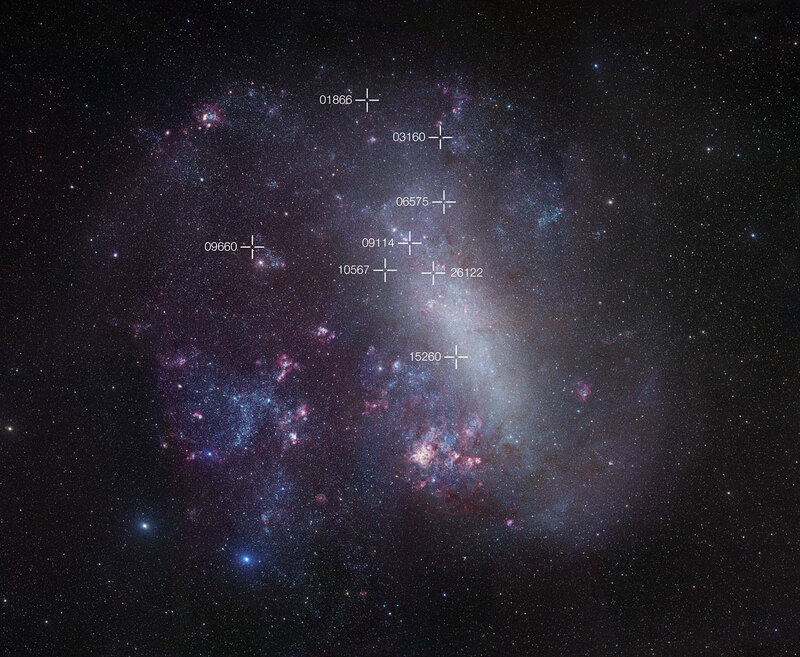 So the more accurate distance to the Large Magellanic Cloud immediately reduces the inaccuracy in current measurements of cosmological distances. The astronomers worked out the distance to the Large Magellanic Cloud by observing rare close pairs of stars, known as eclipsing binaries . As these stars orbit each other they pass in front of each other. When this happens, as seen from Earth, the total brightness drops, both when one star passes in front of the other and, by a different amount, when it passes behind . By tracking these changes in brightness very carefully, and also measuring the stars’ orbital speeds, it is possible to work out how big the stars are, their masses and other information about their orbits. When this is combined with careful measurements of the total brightness and colours of the stars  remarkably accurate distances can be found. This method has been used before, but with hot stars. However, certain assumptions have to be made in this case and such distances are not as accurate as is desirable. 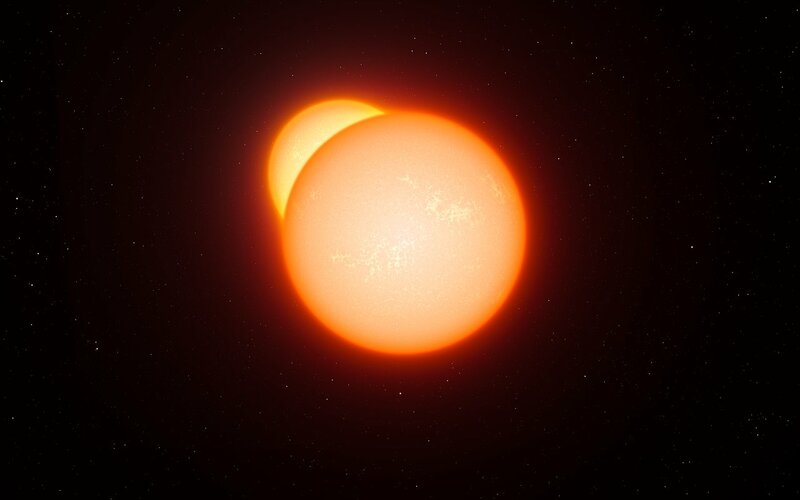 But now, for the first time, eight extremely rare eclipsing binaries where both stars are cooler red giant stars have been identified . These stars have been studied very carefully and yield much more accurate distance values — accurate to about 2%. “ESO provided the perfect suite of telescopes and instruments for the observations needed for this project: HARPS for extremely accurate radial velocities of relatively faint stars, and SOFI for precise measurements of how bright the stars appeared in the infrared,” adds Grzegorz Pietrzy?ski (Universidad de Concepción, Chile and Warsaw University Observatory, Poland), lead author of the new paper in Nature. “We are working to improve our method still further and hope to have a 1% LMC distance in a very few years from now. This has far-reaching consequences not only for cosmology, but for many fields of astrophysics,” concludes Dariusz Graczyk, the second author on the new Nature paper. Standard candles are objects of known brightness. By observing how bright such an object appears astronomers can work out the distance — more distant objects appear fainter. Examples of such standard candles are Cepheid variables  and Type Ia supernovae. The big difficulty is calibrating the distance scale by finding relatively close examples of such objects where the distance can be determined by other means. Cepheid variables are bright unstable stars that pulsate and vary in brightness. But there is a very clear relationship between how quickly they change and how bright they are. Cepheids that pulsate more quickly are fainter than those that pulsate more slowly. This period-luminosity relation allows them to be used as standard candles to measure the distances of nearby galaxies. This work is part of the long-term Araucaria Project to improve measurements of the distances to nearby galaxies. The exact light variations depend on the relative sizes of the stars, their temperatures and colours and the details of the orbit. The colours are measured by comparing the brightness of the stars at different near-infrared wavelengths. These stars were found by searching the 35 million LMC stars that were studied by the OGLE project. This research was presented in a paper “An eclipsing binary distance to the Large Magellanic Cloud accurate to 2 per cent”, by G. Pietrzy?ski et al., to appear in the 7 March 2013 issue of the journal Nature. The team is composed of G. Pietrzy?ski (Universidad de Concepción, Chile; Warsaw University Observatory, Poland), D. Graczyk (Universidad de Concepción), W. Gieren (Universidad de Concepción), I. B. Thompson (Carnegie Observatories, Pasadena, USA), B., Pilecki (Universidad de Concepción; Warsaw University Observatory), A. Udalski (Warsaw University Observatory), I. Soszy?ski (Warsaw University Observatory), S. Koz?owski (Warsaw University Observatory), P. Konorski (Warsaw University Observatory), K. Suchomska (Warsaw University Observatory), G. Bono (Università di Roma Tor Vergata, Rome, Italy; INAF-Osservatorio Astronomico di Roma, Italy), P. G. Prada Moroni (Università di Pisa, Italy; INFN, Pisa, Italy), S. Villanova (Universidad de Concepción ), N. Nardetto (Laboratoire Fizeau, UNS/OCA/CNRS, Nice, France), F. Bresolin (Institute for Astronomy, Hawaii, USA), R. P. Kudritzki (Institute for Astronomy, Hawaii, USA), J. Storm (Leibniz Institute for Astrophysics, Potsdam, Germany), A. Gallenne (Universidad de Concepción), R. Smolec (Nicolaus Copernicus Astronomical Centre, Warsaw, Poland), D. Minniti (Pontificia Universidad Católica de Chile, Santiago, Chile; Vatican Observatory, Italy), M. Kubiak (Warsaw University Observatory), M. Szyma?ski (Warsaw University Observatory), R. Poleski (Warsaw University Observatory), ?. Wyrzykowski (Warsaw University Observatory), K. Ulaczyk (Warsaw University Observatory), P. Pietrukowicz (Warsaw University Observatory), M. Górski (Warsaw University Observatory), P. Karczmarek (Warsaw University Observatory).